With KeepSolid OEM service your apps grant more benefits for your customers. They get access to the KeepSolid VPN features, and you gain more profit from your app. We offer different approaches for the app monetization. Average charge is approximately 300f the current VPN Unlimited prices per a single user of the app. The gap between client’s payment to Google Play or AppStore and our charge is about 10 days. We suggest a 50/50 Revenue Share model. 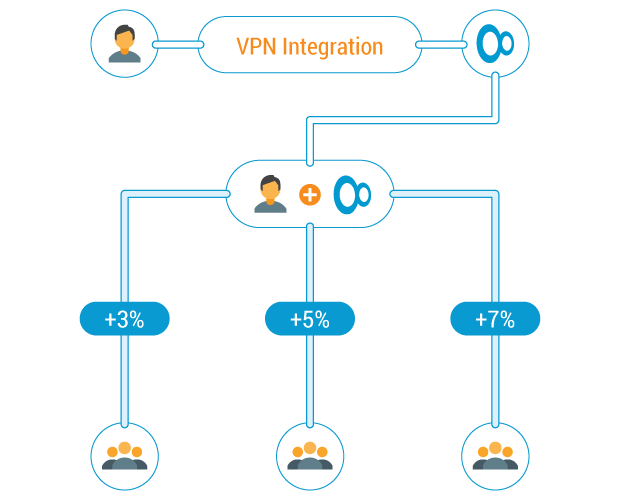 Average charge is approximately 30% of the current VPN Unlimited prices per a single device. Still have any questions? Read more about our partnership programs or contact us at .